The overturning of four Saints' bounty suspensions was a massive victory not just for the the weakest union in pro sports, but for the collective bargaining process in itself. The appeals panel didn't find that the players were innocent—it didn't even consider the question—but rather that commissioner Roger Goodell had stepped outside his jurisdiction when he unilaterally handed down punishments and then upheld his own ruling. The CBA did exactly what it was supposed to do: It dictated the actions that management was allowed take against labor, and it offered the redress of an independent appeals process. The NFL has an incredible recent record of seeing its disputes end up in court. The Saints players brought a lawsuit, still pending, over the bounty suspensions. Last year, after temporarily decertifying the union, the players filed an antitrust suit seeking to prevent a lockout. We can add to that the Supreme Court smacking down the league's merchandising monopoly and the never-ending concussion lawsuits and now White v. NFL. Has there ever been an established league that spent more time in courtrooms defending its very foundations than Roger Goodell's NFL? The facts in the White case are straightforward and damning, and largely agreed upon by both sides. In 2010, the last year of an expiring labor deal, there was no salary cap. Teams were ostensibly free to carry whatever payroll they could afford, but in their summer meetings the owners came to a secret agreement. No one would cross the $123 million boundary, because if some teams spent freely, that would drive up prices for teams that would rather not spend at all. The imaginary salary cap "came up several times in our meetings," said John Mara, Giants owner and chairman of the NFL's management committee. Still, four teams took the gentlemen's agreement as something less than binding, because after all: There was no actual rule. The Redskins, Cowboys, Raiders, and Saints all spent more than $123 million, despite being warned "at least six times" that serious consequences would follow. And sure enough, the gavel came down. 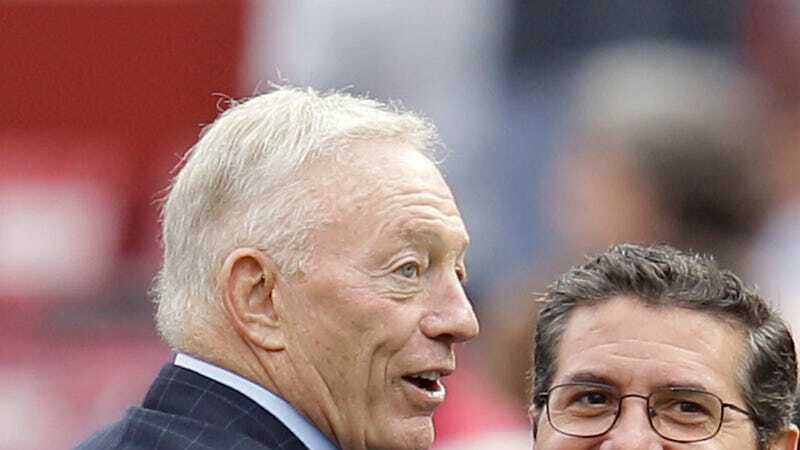 This season and next, Washington and Dallas (the two biggest spenders) will forfeit a combined $46 million in salary cap space, to be distributed among the other teams. In other words: Dan Snyder and Jerry Jones are being punished for failing to collude with their fellow owners in a secret deal to keep hundreds of millions of dollars out of the hands of NFL players. The NFL's initial justification, when it announced the penalties this spring, was laughable. A league statement cited "an unacceptable risk to future competitive balance," as if this were a matter of the sport's integrity rather than a transparent cash grab. Officials dropped that line of defense when it was pointed out that seven teams spent less than the previous year's salary floor without being punished. The next tack: a nonsensical appeal to justice, in which the only jurors were the same owners who had agreed to the imaginary salary cap in the first place. Sure enough, a unanimous vote upheld the Redskins' and Cowboys' punishments. Why Can&apos;t Roger Goodell Go One Day Without Lying? Less than 20 years removed from a time when the NFL had no free agency, the CBA itself remains extraordinarily owner-friendly. To preserve its percentage of league revenue (still less than the players' share in the other three major sports), the union gives up the chance for outside redress, agreeing to settle all matters with arbitrators and appeals panels. And when it does try to fight within the system, it's severely handicapped. Consider: the NFLPA did initially sign off on the league's salary cap punishments, but only after being threatened with lower caps for every team. The only way to challenge the salary cap punishments now, after they've gone through the collectively bargained appeals process, is to "re-interpret" the entire 1993 settlement that allowed for a salary cap in the NFL and punish the owners' collusion to the tune of $4 billion in damages. That's a tall order even for U.S. District Court Judge David Doty, who's made a series of pro-union rulings in the past. A "steep hill," Doty calls it, as he decides whether to take the case. So maybe Roger Goodell isn't all-powerful, but in Minneapolis, the NFLPA isn't facing off against the commish. It's challenging the real power behind the scenes, the owners whose cash makes the league go, and the players are finding out just little they and their precious CBA matter when up against 32 billionaires in a smoky back room.